16mm diameter positioning encoder with high resolution can be configured for velocity and position control of DC motors. 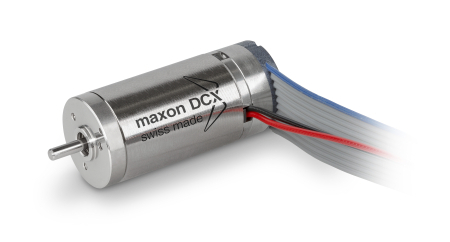 A high precision positioning encoder, the ENX 16 RIO, is now available from maxon motor, offering an impressive resolution of up to 65,536 counts per turn in a compact and rugged housing. Requirements on encoders are becoming more and more demanding. This applies particularly to positioning applications with precision constant-speed control, where increasingly compact housings need to accommodate an ever greater number of electrical contacts. maxon motor solves this problem with its new ENX 16 RIO optical encoder. It is a mere 16 millimeters in diameter and offers a resolution of up to 65,536 counts per turn, making it ideal for the precise position and velocity control of DC motors. The new maxon ENX 16 RIO (Reflective, Interpolated, Optical) encoder fulfills all the requirements for a high-resolution optical encoder in a compact design. The resolution can be configured at the factory or online. With 16 millimeters outer diameter and 7 millimeters overall length, the housing is mechanically robust and protected from dust due to its injection-molded construction. The operating temperature range is -40 °C to +100 °C. The encoder is easily configured online for combinations with maxon motors and can be combined and configured with matching drives. It fits the new brushless EC-i 30 motors and the brushed DCX motors (diameters of 16 millimeters and up). The counts per turn and the electrical interface of the ENX 16 RIO encoder are also configurable.